These easy to make, no-compromise low-carb fries are big on taste but low on carbs. 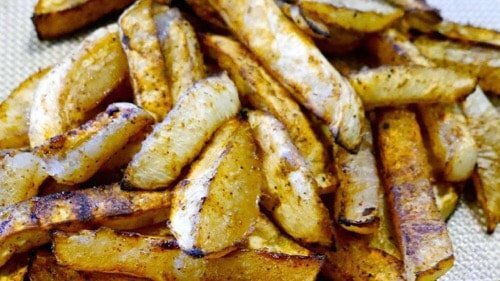 If you’ve been missing salty fry goodness, your search is over! These easy to make, no-compromise low-carb fries are big on taste but low on carbs. 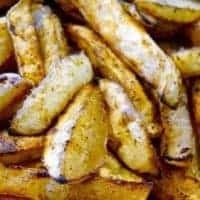 If you've been missing salty fry goodness, your search is over! Is the salt wrong in the recipe? I made this using 1 T and it was inedible (the saltiest thing I’ve ever tasted — and I like salt!). I think maybe it’s supposed to say 1 tsp (?). I just took another look at the recipe. You are absolutely right. It should be 1 tsp instead of 1 tbsp. I am so sorry you ruined a batch of the fries because of my mistake! What kind of turnip ? White? Yellow? Wax? & does it have any fiber to deduct from the 4 carbs ? The only turnips we have in our regional stores are white turnips, so that’s what we used. We will edit the listing to make that more clear for future users. Also, our nutritional boxes reflect net carbs, so the fiber has already been deducted.